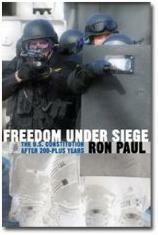 Click here for 20 full quotes from Ron Paul in the book Freedom Under Siege. This book was written in 1987 and re-released for Paul's presidential campaign in 2007. It has no 2007 update, unfortunately, so we have to infer that Rep. Paul still subscribes to all of his policy prescriptions from 20 years ago. The theme of this book is that big government is reducing our personal freedom, slowing our economy, and ultimately will destroy the country. This book will be of interest to people who want a deeper understanding of what libertarians are talking about, and why Rep. Paul has generated such a large army of "Paulistas" in his presidential campaign. Rep. Paul's libertarian philosophy is well-documented here, although he would prefer the term "constitutionalist", meaning one who strictly follows the Constitution. Individual Rights: This topic spans topics from morality to gun control, and we excerpt it heavily. Rep. Paul's thesis is: follow the Constitution, or follow the Amendment process if you don't like what's in the Constitution. The Military Draft: This topic seems very outdated now, so we include just one representative excerpt. Rep. Paul makes only passing reference to the concept of "National Service," which would be the modern equivalent of this topic. Sound Money is Gold: This topic is covered in more detail in Rep. Paul's 1981 book, Gold, Peace, and Prosperity. We include a couple of excerpts and refer more interested readers to that source. We�ve come to accept debt, wealth confiscation, & big gov�t. Gold standard limits deficit spending. Rights belong only to individuals, not collective groups. Gender-equal pay violates idea of voluntary contract. In times of war, our freedoms are threatened at home. Societal inconsistency on alcohol contributes to drug use. State role on medical care for children undermines freedom. Policy of non-intervention, neutrality, & independence. $140B to protect Europe creates competitive disadvantage. Foreign aid helps dictators, not the people of aided country. Our government routinely lies to us. Judges have become legislators by de-emphasizing juries. Federal abuses today worse than King�s in 1776 revolution. Reassess �mutual security� treaties; our allies never aid us. Conscription is a trait of totalitarian government. Appears that American republic is in its waning days. 1986 tax simplification made tax code more incomprehensible. Gov�t computer snooping makes National ID Card inevitable. Internationalists favor perpetual war by fear-mongering. 1980s Libya bombing was an unauthorized act of war. by Ron Paul (first published 1987; reprinted Nov. 2007).